All answers are to be typed in your the Google Doc called Newton's Stations Responses. Extend your arms straight in front of you. Hold the balloon between your hands. Make sure nobody is near you. Keep your arms straight in front of you, moving only at your hips, swing the balloon all the way left and then all the way right. Move back and forth several times as quickly as possible. Then switch to the medicine ball. Observations comparing and contrasting the motions and which was harder to rotate. Place the cup on the table; the card on the cup, and the coin on top of the card. Quickly flick the corner of the card with your finger being careful not to touch the cup. Place the paper on the table. Place one or more coins on the table. 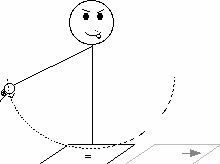 In a sweeping motion move your hand down to the paper and let your finger push the paper off the table. Place one bottle on the table. Place the round emblem on a dollar over the bottles opening. Place the second bottle upside-down on the dollar on top of the other bottle. Line the two bottles opening up exactly on one top of the other. You are going to remove the dollar from between the bottles without touching the bottles and without the top bottle falling. For right handed people, hold the end of the dollar with your left hand. Hold it VERY TIGHTLY and dont move the dollar such that the top bottle moves. If the top bottle moves, realign the bottles. Important safety note: have a second person stand with his or her hands hovering around the top bottle. Point your right hands index finger. With a karate shop like motion, chop George Washingtons face. The WHOLE TIME DO NOT MOVE YOUR LEFT HAND or the dollar bill. It the top bottle should wobble and/or fall, the person with his or her hands hovering around the top bottle should catch it. A Hoberman sphere is a structure that can expand and contract. Place the rubber band around the Hoberman sphere. Toss it back and forth to a partner in such a way as to make it spin in the air. DO NOT LET IT HIT THE GROUND. Now take the rubber band off the Hoberman sphere. Toss it back and forth to a partner in such a way as to make it spin in the air. DO NOT LET IT HIT THE GROUND. Observations compare and contrast the motions and how easy it was to swivel the pipes back and forth . You have two lanes and two cookie tins. The cookie tins are equal in mass. Race the cookie tins down the ramp. But here are the rules. Do not push the tins. Have someone say the words Ready...Set...Go. On the word,go, let go of the tins and let them roll down the ramp. Note which one wins. Switch lanes and race them again. Note which one wins. The tins are more fragile than you think. Do not drop them. Do NOT open the cookie tins. Place the two LEGO block cars side by side. They have the same mass. But notice the difference in how much mass is spinning. Race them down the ramp. and let them roll until they come to a rest on their own. 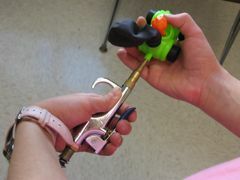 Inflate the balloon car with the pump. DO NOT USE YOUR MOUTH TO INFLATE THE BALLOON UNDER ANY CIRCUMSTANCES! Hold the pump tight against the back of the car. Slide the pump back and forth. Be careful not to over inflate the balloon -or it will pop. with the balloon inflated, quickly put the car on the table and let go.  All long hair must be tied back.  Safety glasses must be worn by all team members.  Make sure the ball is not aimed towards anybody. • If the string is still smoldering after being lit, put is in the cup of water next to the station. Use the string loop to pull the rubber band back. Place a ping pong ball in the rubber band. See the example at the activity station. Do not take anything apart from the example. We no longer use the 10 pipe pieces, instead place the platform on the table top itself. Watch the video below to see how to setup this station. Click here to go to YouTube to watch the video. (It may load faster this way. )The page will open in a new window. Make sure nobody is in front of the launcher. Place the front of the launch to the edge of the table. For hte picture below, the table edge would be lined up with the launchers left edge. Use the lighter to burn the string. Observe the balls speed and the launcher platforms speed after the launch. Repeat this process with golf ball. Go to the web page http://www.mrwaynesclass.com/teacher/Kinematics/flat. It will open in a new screen when you click this link. Drag the lights so that when the "Go" button is pressed the pressed you each light will turn green at an equal time interval. When each light turns green, a bell will also sound. Pay attention to the time interval between the ring chimes.The screen has a graph paper like grid in the back ground. Use this background to help you with the light spacing. Go to the web page. http://www.mrwaynesclass.com/teacher/Kinematics/incline. It will open in a new screen. This time the lights are on an incline. Move to that their space is NEARLY the same as in part "A." Press the "go" button. If they do not ring or turn green with an even time interval between them, then press the reset button and adjust them until they do ring/turn green with an even time in between them. Raise one end of the ramp so that the ramps end about 10 cm , 4 inches, high. The chimes should still be evenly spaced like before. Release the marble from rest at the top of the ramp. Pay attention to the time interval between the ring chimes. Slide the chimes such that when the bearing rolls down the ramp you will hear an evenly spaced ding, ding, ding, ding. Pay attention to the spacing between the chimes. Only answer these questions AFTER completing ALL the stations.